Sunday's Coming: Swinton Lions - and a whole lot of tension. We start our look ahead to the weekend with a disbelieving look back to last week’s shock announcement of an RFL proposal to restructure the Championship and League 1. 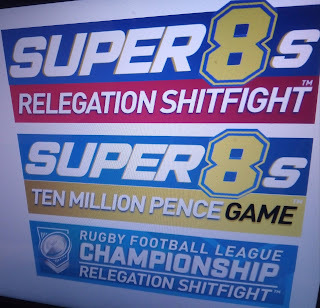 Hastily conceived (it seems) to pacify an increasingly protectionist Super League and secure funding for the lower tiers, it’s a proposal that could turn this season on its head - with potentially huge ramifications for Swinton and Hornets. The proposal - yet to be ratified by a vote of RFL member clubs - centres around the expansion of the Championship to 14 clubs. This will entail the automatic promotion of League 1’s top two sides (handy now Bradford have slipped off the pace) - plus the promotion of a third via a playoff system. Woah… wait a minute… a week ago Sunday’s game at Swinton was being billed as the wooden spoon decider to be fought-out by two teams needing snookers and the bankruptcy of Leigh and Barrow to avoid the drop into League one. But now you’re telling us that this could pretty much be the game that keeps one of these clubs in the Championship? At ten days’ notice? Whilst this proposal remains unconfirmed, the insider view is that it’s expected to get enough votes to be passed. Which turns Sunday’s game into a very serious proposition that fans are already calling the ’10 Million Pence Game’ - such is the likely financial impact of staying in/exiting the Championship. After challenging seasons for both Hornets and Swinton, this new ‘development’ feels like a kick in the spuds too far - effectively turning Sunday’s game into a gladiatorial scrap to the death for two clubs already near-exhausted by the travails of a brutally unforgiving season. At last: Rugby League tells it as it is. Elsewhere in the League Express, Gareth Walker describes the game as (effectively) “… a shoot out for 11th place…”, “… massive for both clubs…” and the first in: “… a list of crucial must-see fixtures…”. Walker also recognises the potential impact, heralding: “… a nervous end to the season for the fans of both clubs.” Too right. 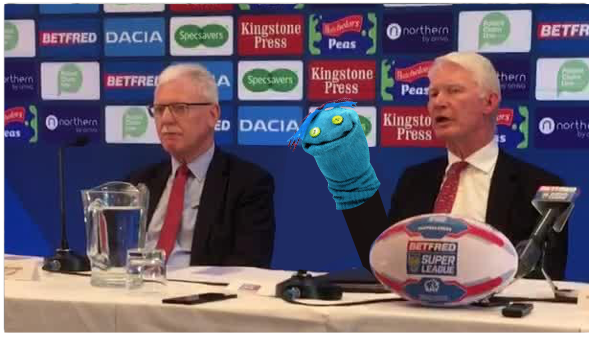 The biggest issue, though, is that Rugby League has - once again - trashed its credibility in the eyes of the sporting world. Changing key structural criteria six weeks before the end of a season - criteria on which clubs are trying to plan for 2019 - is amateurish at best. 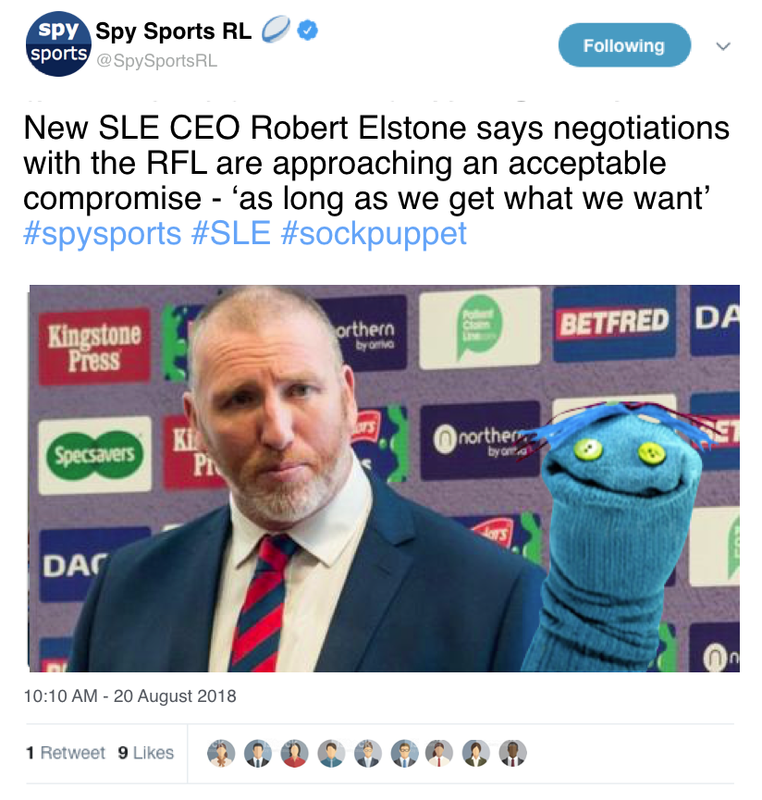 However, it would be fair to say that the RFL’s hand has been forced by pressure from Super League Europe Ltd to find a (hurried) compromise position in order to maintain the distribution of funding in the immediate term. Once put in that position you’re into damage limitation and finding somethng that inconveniences the least number of clubs. It just so happens that the clubs squeezed by the change are Hornets and Swinton. The cruelty of it is that it turns what would have been a relatively low-key game into one which could significantly impact on the future of both clubs: a whole season and the next few year’s planning boiled down to one 80 minute dogfight that will cost the loser £100,000. 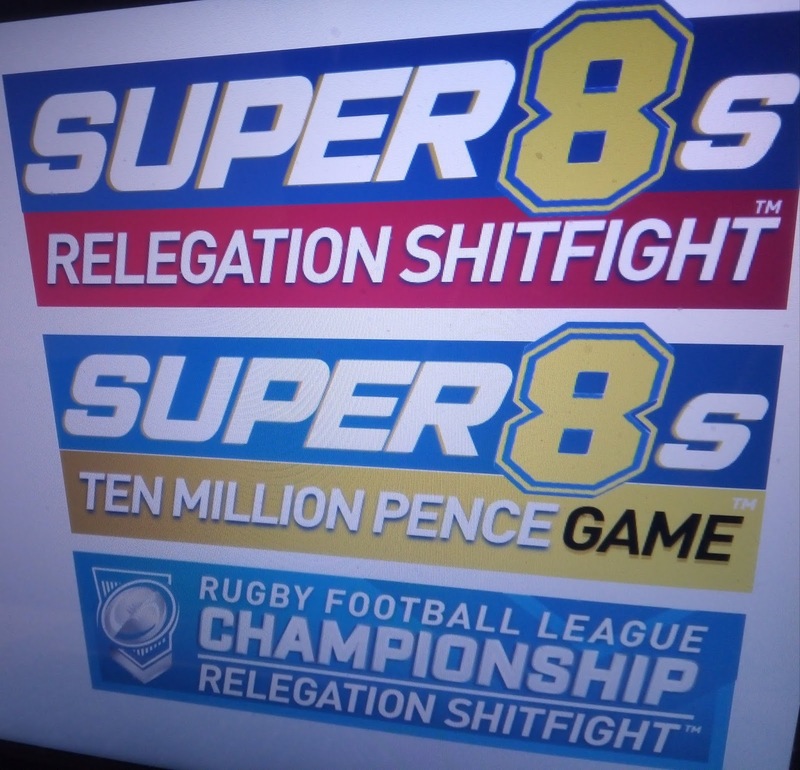 Despite compelling the RFL to turn the Championship season into a straightforward duel, Super League Europe Ltd have denied all responsibilty for forcing the change. 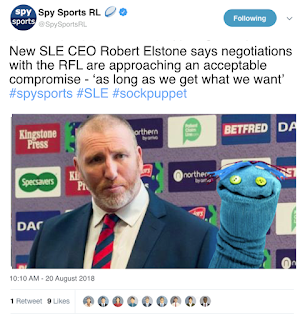 Speaking this week, Super League’s Propagandist Sockpuppet™ Robert Elstone said that - despite his paymasters seeking to jerrimander the league structure to leave as much cash as possible in the hands of loss-making SL clubs - that the hastily concocted new plan had nothing to do with him, honest guv’. But it seems that someone at SLE Ltd headquarters has a 'selective memory'. Lip Service: Who's working who here? Your guess is as good as ours. But while Elstone struggles to remember what he said a fortnight ago, Hornets and Swinton will endeavour to navigate the fall-out. If ever your team needed your support, it’s now. Let’s see this through together: see you on Sunday. Fast forward to a muggy, drizzly day at Spotland and lo - before us sit Featherstone Rovers. No top four, no cash bonanza. No Brad Dwyer. Shorn of motivaton, incentive and a one man points machine, Featherstone proved to be an altogether less challenging proposition as - for an hour - they looked like they’d really rather be somewhere else. Hornets on the other hand sniffed the opportunity to add to Rovers’ woes and - with only a 16-man squad available to the departing Alan Kilshaw - came agonisingly close to upseting the odds. Despite conceding a drop-out from Fev’s first set, Hornets set to work early doors. Having hoodwinked an offside penalty at a scrum, Hornets marched straight downfield where they forced a drop-out of their own from a Danny Yates kick. The Hornets pack drove Featherstone backwards, Ben Moores revealed a cheeky grubber and - as the Rovers defence debated a reaction, Lee Mitchell reached in to score. Tyler Whittaker the two - plus a penalty shortly afterwards - saw Hornets with a comfortable 8-nil lead after 10 minutes. The visiting fans audibly disgruntled at Hornets' audacity. Their ire rose further as Hornets stuck to playing what football was on offer: Jo Taira punching holes in the defensive line; a teasing break by Luke Adamson and Tyler Whittaker; then Taira again, smashing the wind out of Maskill to force a knock-on. On the quarter mark, the traffic was decidedly one-way - and as Hornets kicked high over a retreating Rovers defence, the ball tipped tantalisingly from Miles Greenwood’s fingers. The let-off roused Rovers from their slumbers - and they got lucky when the ball squirmed free following a last-tackle kick going nowhere to give them a repeat set at close quarters. Hornets stood firm and went back downfield, but a moment’s hesitation at a dropped pass saw the visitors work the ball wide on the free-play for Thackeray to capitalise on a stretched right-edge defence to score. Hardman the extras and - after half an hour - the Featherstone fans finally had something to be less grumpy about. Things got less miserable still just two minutes later. Lewis Hatton was removed for a head check after a collision in a tackle and, while Hornets were reshuffling their middles, Featherstone exploited the situation: Davies hitting a flat ball to score as Hornets scrambled back into shape. Unfortunate. Hardman the conversion and Fev ahead 8-12. With the half counting down, more determined defence forced a Rovers knock-on. Hornets worked their way back to the visitors’ goal-line and Tyler Whittaker looked to have touched down a kick into the in-goal - but referee Mr Bennet gave a drop out instead. Hornets' response was clinical. A solid set to stand Rovers on their own goal-line, then Rob Massam launching from acting half through a hapless Whylie on the last tackle to score. Tyler Whittaker good with the boot and Hornets headed for the sheds 14-12 up. And deservedly so. Hornets began the second half capitalising on a flurry of Featherstone errors: a knock-on first set; then Robinson making a total hash of a Whittaker bomb. Hornets were swift and direct in response: Billy Brickhill piling in from close range only to be called ‘held-up’. No matter. Hornets moved the ball across the face of a static Rovers defence and when Yatesey launched a lofted kick towards a hesitant Whylie, there was only going to be one winner as Rob Massam gathered in the air to score. Tyler Whittaker on target from the touchline and Hornets 20-12 up before most of the Rovers fans had got back from their fag-break. Then, a momentum shift. Hornets again switching on too late at a free-play - this time Newman with the try. Then Mr Bennet reading a Rovers knock-on as interference. Newman again up the edge to score and - against the run of logic - Featherstone somehow ahead at 20-24 going into the final quarter. With the game now an arm-wrestle, both sides struggled for impetus: Thackeray involved twice, firstly hoofing the ball dead - spitting his dummy after gleeful Hornets celebration. Then the target of an absolute bell-ringing tackle by Jo Taira that saw Newman square off against Seta Tala in the aftermath. A shaken Featherstone taking the two - then a Thackeray drop-goal on 71 minutes. The Rugby League equivalent of parking the bus. Hornets regatherted the kick-off and - 45 seconds later - Seta Tala latched onto a Danny Yates kick behind a flat-footed defence to close the gap to 24-27. Six minutes to win it - and Hornets had every intention of doing so, working the ball to Massam, who skinned Whylie and pinned back his ears, only for a despairing dive from Taulapapa to halt what looked like a nailed-on try. Back in possession, Rovers huffed and puffed their way downfield - Jo Taira (now playing in the centre) and Richard Lepori darting back to snuff out a break. Somewhere in what appeared to be a perfectly good tackle, Mr Bennet saw a high shot and - with seconds left on the clock - Davies came rumbling in from close range to score through a weary defence. Hardman completing a perfect afternoon with the boot; Featherstone flattered at 24-33. There’s no doubt that this was a tough one to swallow. Again Hornets gave it absolutely every ounce - their depleted side putting in a monumantal shift against a Rovers outfit unrecogniseable from a month ago. Yes, Featherstone are clearly in the ‘not-remotely-arsed’ zone - but to turn round an 80-point drubbing to a point where Hornets were one Taulapapa tackle away from a win they would have deserved is a feat to be lauded. Ultimately, both sides leave this game contemplating the relativity of success and failure. Fev head for the Shield final with their season in tatters, Hornets stare down the barrel of relegation having - again - come tantalisingly close. But Featherstone have burned three or four times Hornets’ budget this year to end up in the same half of the split - and just nine points better. Not much of a difference at all. Sunday's Coming: But Killer's Going! A week is a long-time in Rugby League - and what a week this has been. Ahead of this weekend’s clash, both Hornets and Featherstone have been dealing with the challenges of life in an increasingly difficult Championship. Edged out of the top four by Halifax, Featherstone don’t have a great deal to gain from schlepping round the Championship shield. Along with fast-imploding Leigh, Fev bring a 16 point advantage into this competition and, with only 14 points available over its seven protracted weeks, they face a series of dead rubbers before taking their guaranteed spot in the final. The flaw in the system brutally exposed - though the arse might drop out of Leigh long before the final comes round. Featherstone come into Sundays game on the back of two results that are eyecatching for different reasons. Two weeks ago they made history when they became the first side to beat Toronto on their own patch - a 16-man Fev squad claiming a 30-12 win over a clearly ‘not-arsed’ Wolfpack preparing for the Super 8 Qualifiers. In contrast, Rovers struggled to a 26-12 home win over Batley last week - having been locked at 6-all at the break. With Batley ahead on the hour mark, it took a quick-fire triple from Thackeray, Cooper and Maskill to wrench the game away from the Bulldogs. The win came at a price for Fev, though: Scott Wheeldon with a leg injury in the first minute - and his replacement Sam Brooks removed with a eye socket damage. With six games to go, there’s still the opportunity for Hornets - and Killer - to go out with a bang. There remains a chance that Sheffield could blow-up and, with nothing to lose, Hornets could spring a shock or two. Given Alan Kilshaw’s ability to upset the bookies, whilst there’s still even the slimmest of chances, we wouldn’t write the season off just yet. This was a tense game that tested the emotions. A game of three-quarters and a quarter, where Barrow took advantage of two fortuitous incidents to grab just enough momentum to edge this game beyond a despairing Hornets’ grasp. For 60 minutes, you couldn’t squeeze a fag-paper between these two teams: Barrow one-dimensionally throwing big lads at the Hornets line; Hornets committed, resolute - arguably the best defensive performance of the year. The game began with a bang. Barrow’s wunderkinder Joe Bullock skittled with less than a minute on the clock: dismissed for a head test. Plenty of work for Adrian Lam to do on his tackling techinique. Barrow then gifted a penalty for a spurious high-shot - only for Lee Mitchell (having his best game in Hornets’ colours) to absolutely monster Dallimore: Barrow forced into a poor last tackle option. With barely time to catch breath, Hornets went on the attack: first chasing down a huge kick (only to get snagged again by referee Mr Griffiths) then Dion Cross embarking on a weaving run, only for the last pass to fall to Barrow winger Loxham - who was summarily pounded by Lee Mitchell and led staggering from the fray. Clearly frustrated, Barrow were reduced to niggling at every tackle: Dallimore now following Mr Griffiths around the field begging for penalties and continuously skriking like a mard child. Hornets’ response was to keep playing what little football was on offer and, when Morgan Smith was hit high on a foray to the posts, he picked himself up and tucked the penalty away: 0-2. In pantomime style, the playing of Mr Griffiths now spread to the crowd: they shouted for a penalty and he responded in Pavlovian style - and the referee was once again in the spotlight when - on 20 minutes - Hornets debutant Ryan Millington executed a perfect one on one tackle only for Mr Griffiths to deem that he’d tipped Carter over the vertical. Which he hadn’t. And when a Barrow player took a South American soccer-style dive at a play the ball, Dallimore waved his arms like a car-dealership inflatable promotional character and Mr Griffiths obliged. All a bit cheap. The game was now attritional - both sides coming up with errors. And when Carter ducked into a Seta Tala tackle on 26 minutes, more home-side histrionics saw him yellow-carded. Barrow’s response to gaining a man advantage was to send a series of lumps lumbering at the Hornets’ line. Not only did Hornets respond with some sterling defence, they added another penalty via Morgan Smith to go 0-4 up. The half ended with Dec Kay removed from the field with what looked like a shoulder injury (incident one): Miles Greenwood pressed back into service. There was just enough time for a Barrow break up the left off a loose ball, culminating in a mystery penalty. Them more one-man rumbling until the hooter delivered much needed respite. Hornets began the second half with puropse. Lee Mitchell driving close to the Barrow line, then Billy Brickhill plunging in from acting half for what looked like a perfectly good try. Five feet away, Mr Griffiths put whistle to lips, but his attention was drawn by more Barrow bleating to the touch-judge 40 metres away who claimed to have seen a knock-on. No try (incident two). No matter. Hornets went straight back downfield where a last tackle Yatesey kick into the in-goal sqirmed away from a lunging Miles Greenwood. Off the hook, Barrow resumed the arm-wrestle: stifling any opportunities to play football. Their only concession to entertanment was a steepling bomb on the hour-mark from which they gained a drop-out. Bartes piled the ball back towards the Hornets line and Smith arrived like a runaway bin-wagon to crash his way in and ground the ball. Dallimore the extras and Hornets 6-4 down. Two minutes later, Hornets looked to have snaffled possession back in a good position when Pat Moran stole the ball one-on-one - only for Mr Griffiths to misinterpret the associated Law and give Barrow another gift penalty from which they forced a repeat set. On 65 minutes, Mr Griffiths again yielded to the Dallimore’s endless nagging to give him a penalty that he gleefully kicked. And whern Tyler Whittaker arrived late at a tackle on 70 minutes, Dallimore extended the home-side’s lead to 10-4. Reeling, Hornets repelled a series of Barrow drop-goal set-ups, but when Johnston finally got one away to give the Raiders a seven point lead with four minutes remaining, you sensed that it’d be enough. As it was, Barrow capped a pig-ugly performance with a union-style pushover-try in the 77th minute: Susino under a pile of bodies: Mr Griffiths this time happy that the ball had been grounded. To their credit, Hornets kept playing to the death: a show-boating Dallimore produced a quite awful chip & chase, Miles Greenwood steamed the ball back up the Hornets right-edge and he drew tacklers to send Dion Cross over on the hooter. Smith the two - final score 17-10. There’s no denying that this was hard to take. We speak sometimes about how a side needs a bit of mongrel in it to drag them through. Here Hornets gave every ounce only to be edged by a team that’s pretty much all mongrel: 26 penalties tells its own story. The outcome is that Hornets - and Swinton (who choked to ship 34 second-half points at Dewsbury) - now need snookers to stay up. Sheffield have replaced Barrow as the team to chase, but Hornets will need four wins with six games remaining. And for Sheffield to lose four. Not impossible - but incredibly difficult. Finally a mention for the Hornets fans who gave a great account of themselves - raising the roof even though they were massively outnumbered. Though their post-match appreciation of Hornets efforts was marred by an accusation - by an animated Barrow fan - that other Barrow fans had racially abused Hornets players. And so it begins. The mathematics of the next seven weekends are brutally simple. Win three games more than Barrow and one game more than Swinton and we stay up. Which makes Sunday’s trip to Craven Park the definitive ‘must-win’ game. He then went on to confirm that Barrow had taken three Catalan Dragons reserve players on loan - Props Mendy Saloty and Arnaud Bartes and winger Georgy Gambaro. A culture-clash indeed. In the debit column, Crarey lost Toronto loan utility back Jonny Pownall, who basically baled to go to Bradford without giving Barrow any notice whatsoever. Crarey only found out about the move when Toronto’s UK operations manager Martin Vickers called him and said that Pownall was ‘unwilling to remain with Barrow’. As it was, a disrupted Barrow side were mercilessly flogged 72-6 at Craven Park by a ruthless London Broncos two weeks ago. Interestingly it was second consecutive 70 point home defeat after a similar pummelling from Toulouse. Our favourite stat: Barrow shipping 27 tries in two consecutive home games. Ouch! Not untypically, Barrow’s respite couldn’t wait another week. Stand-off Lewis Charnock is in the frame for a return on Sunday as are Jarrad Stack, Declan Hulme and Jono Smith. Talking to Total RL last week, Alan Kilshaw was in bullish mood about Hornets chances of staying up. Indeed for the next seven weeks, the league becomes an equation that Hornets have to resolve - and every point gained takes us closer to the right answer. If you can get up to Barrow, we urge you to do so. It’s a tough place to put in a performance and every ounce of support we can muster will make a difference. Let’s do this.